LE print on paper or canvas. The Limited Edition on paper or canvas is signed by the Artists and is 11 x 14 image size. The Fine Art LE Canvas Giclee Prints are embellished by the Artists. Mini prints on demand can be ordered here unsigned as 5 x6 or 8 x 10 sizes, you also may choose custom matting and framing for your order. The scene was painted as an original oil in 1990 through our collaborative efforts. It is a heartwarming scene that has been familiar to me all my life and charmed my husband Kevin. 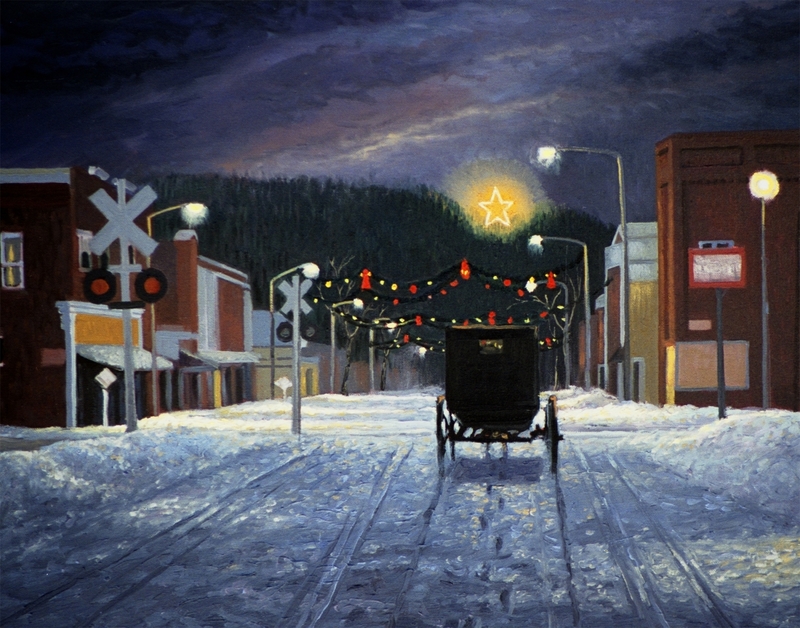 It depicts the small town of Whitehall WI during the Holiday Season. The Amish buggy heads home through the streets in the evening light. The star that is seen on top of the hill in the background lights up the night sky. 5" x 6.375"8" x 10.125"